Doing things the traditional way can pay off handsomely, though it can really cut into profits when the poor skip the concession stand and smuggle in their own fruit to hurl at pilloried criminals. 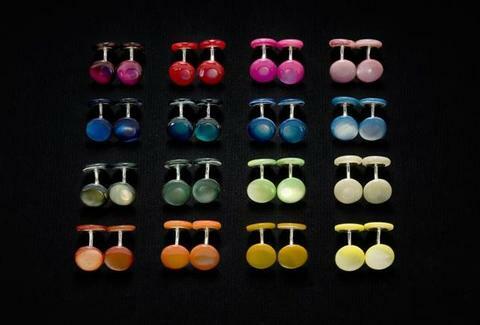 For cuff-links crafted with the past in mind, try Samuel Gassmann. A Parisien former curator and art consultant, Gassmann's cuffs return to the old school in both form and function: they're made using 19th century techniques, and are categorized by time-of-day-worn and intended usage, a return to yesteryear's "fundamental dress codes" -- nowadays reduced to "no trainer's, mate". First, the manufacture: the raw materiel is milled into a "pion" (a miniature cylinder with two flat surfaces at either end), then dipped in a bath of muriatic acid to scour away burnt edges, and polished for six hours in a wooden barrel filled with water and powdered pumice; finally, the pieces are lustered with stearine polish and sawdust, and the two halves are threaded together using a "Cordonette" -- apparently not French for "Matthew Horne". Cuffs come in five lines, including Day, featuring styles like the sterling silver-linked "Day Cabochon", made from true white mother of pearl (as opposed to modern imitators troca or burgau shell) with a small sun finely etched in the corner; Evening and its bronze-linked "Chronos", whose grey mother of pearl bears a man's profile; and Sports, whose "Sports Button" comes with Olympics-esque gold, silver, or bronze links, and four dark spots marking its white porcelain -- if this happens to your white porcelain areas, consult your GP. Slightly more ceremonially, there's the Decoration series, including the "Half Sphere" (an outfacing dark cabochon gemstone, w/ a solid silver support joining the two halves), and the Pomp and Circumstance collection, featuring a trio of "Archetype2" pairs that depict the three stages of a man's life via successive facial profiles -- which sadly for lovers of traditional corporal punishment aren't "Young", "Middle Aged", and "Covered in Fruit".